South Indian food is hugely popular not just in India but also in the rest of the world. Idli, dosa, medu vada (pronounced may-doo vuh- daa) and sambar rank up there with butter chicken and tandoori chicken on the popularity charts. This bean-based Indian fritter is shaped like a donut and delivers bold Indian flavors. Typically, it is eaten as either a snack or a breakfast food. Udupi restaurants, which serve South Indian vegetarian cuisine, can be found around every street corner in India but are increasingly popular in other countries as well. Medu vada is one of those unforgettable Southern Indian meals. It is served with steaming hot Sambar and fresh coconut chutney in some places. Medu vadas are uncomplicated to make, but it can take a little practice to get the shape right. Put the urad daal in a sieve and wash under running water until the water runs clear. Then soak the daal overnight in a bowl of water. Fill the water until it is about an inch over the surface of the daal. In the morning, drain any extra water and add the green chilies, ginger, black peppercorns and curry leaves to the daal. Now grind it into a paste in a food processor adding just a tiny bit of water while grinding so that you end up with a very thick, smooth paste. Add salt to taste and stir to mix well. Heat oil for deep frying on a medium flame. While the oil is heating, grease your palms with oil and put 1 tablespoon of the lentil paste you ground earlier into your palm. 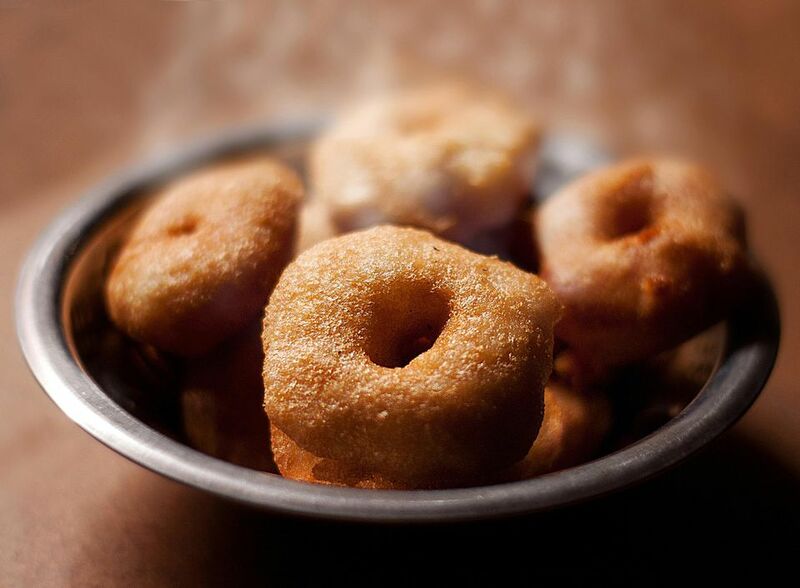 Poke a hole in the center and make into a donut shape (these are the vadas and should look similar to a donut). Slide each vada into the hot oil and fry till light golden. Do not crowd the vadas while the fry as they will stick if you cram them in the pan. When the vadas start to turn a pale golden color, remove them from the oil with a slotted spoon and drain on paper towels. Let them cool. Serve with freshly made coconut chutney and a steaming cup of masala chai tea for a delicious snack! Another serving suggestion: serve medu vada with sambar and coconut chutney and you will have the perfect meal for breakfast, lunch or dinner!